I lived in Dulwich, and worked in Earls Court for about 7 weeks a year when running the Ideal Home Show. One year I thought I’d cycle – before hitting Herne Hill, Tulse Hill and Denmark Hill on the first ride in – the bike stayed in my office until heading home in a taxi seven weeks later! The next year I thought CBT and thus started my motorbike story. Well a scooter first, a mighty Piaggio Typhoon 125. It served me well cutting down my journey time to Earls Court immensely. I have to admit I was no riding god and my ex-wfie happily tells the tale of me being pulled-over by the police as they thought I was drunk, but I had to explain it wasn’t that, I was wobbling as I really wasn’t very good at riding yet! The bike was eventually stolen and recovered, I sold it on for a pittance, but I had been bitten by the bug and for the following year I planned on doing my test and getting a proper bike to help me with the Earls Court commute and more importantly for the nightmare journey to my normal office – Dulwich to Harrow! 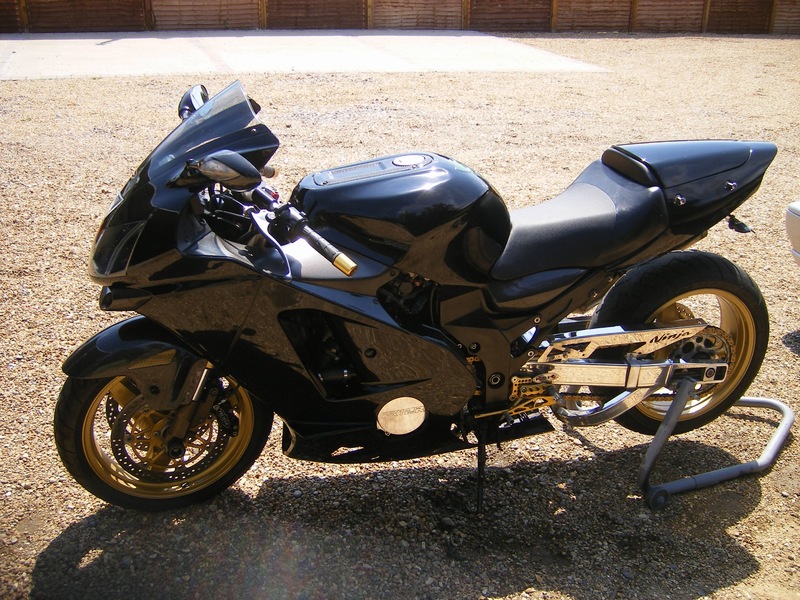 So having put the miles in on the Fazer I opted for a sensible second bike – a 99 Hayabusa! 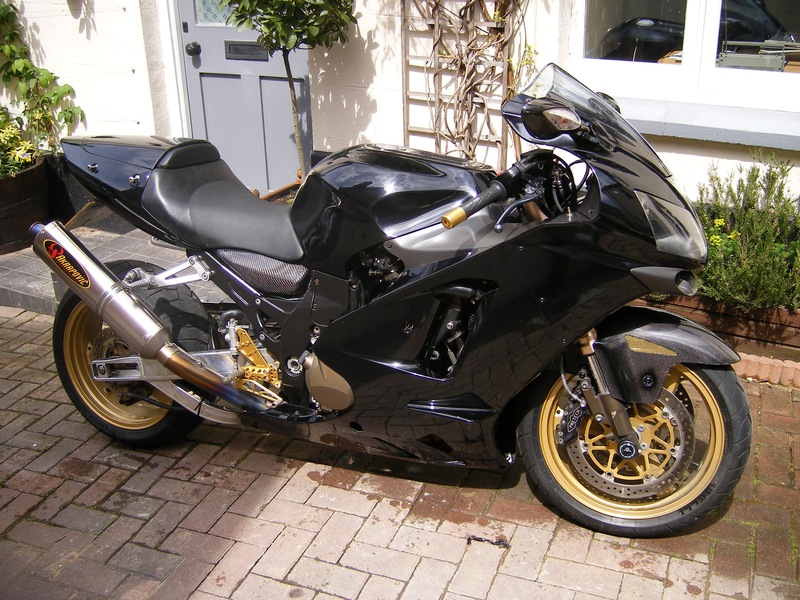 The now legendary 200mph hyperbike (I know it, it wouldn’t actually do that) I used it as a commuter and it was great – as they say the accelerator goes both ways, so treat it with care and it wont bite, and it didn’t. I quickly got it into tweaking the bike which led me to the 200mph Club. 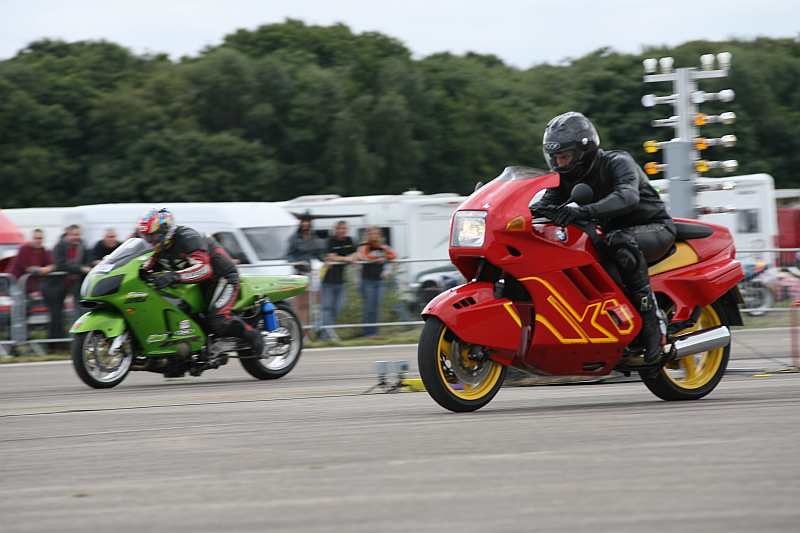 A guy of likes minded riders obsessed with reaching 200mph and proving the Hayabusa was faster than the ZX12-r. Events at Woodbridge and Elvington tried to settle the argument, but of course it still runs on in friendly banter. 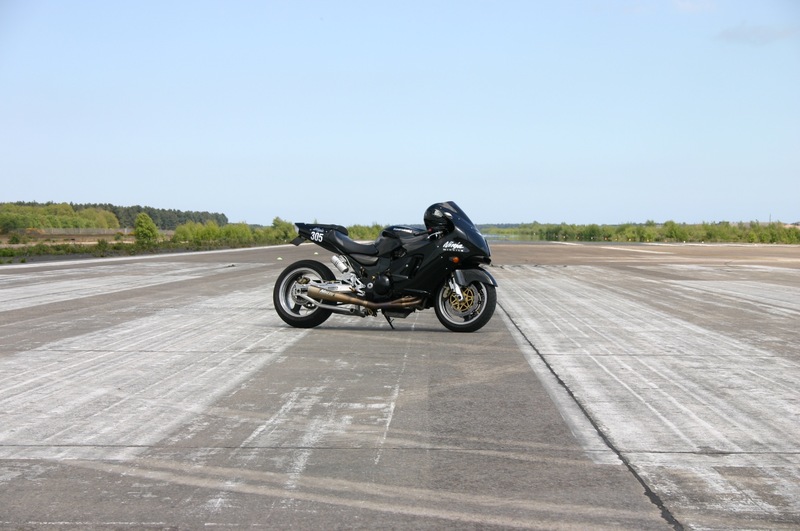 What it did prove is that neither bike was capable of 200mph without some modifications and/or a favourable tailwind. Suzuki Katana – the Donkey Choker. I got bored of the Hayabusa quite quickly and wanted something older and more custom. 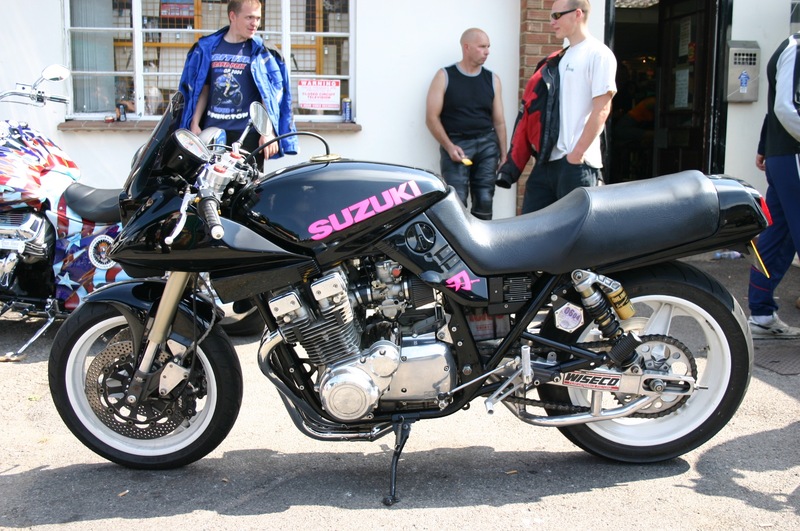 I came across a dream bike of mine, Suzuki Katana, one which had been breathed on by a Suzuki tuning legend and previously featured in Streetfighter Magazine. I blew the original engine doing a top speed flyer at Woodbridge in Suffolk. 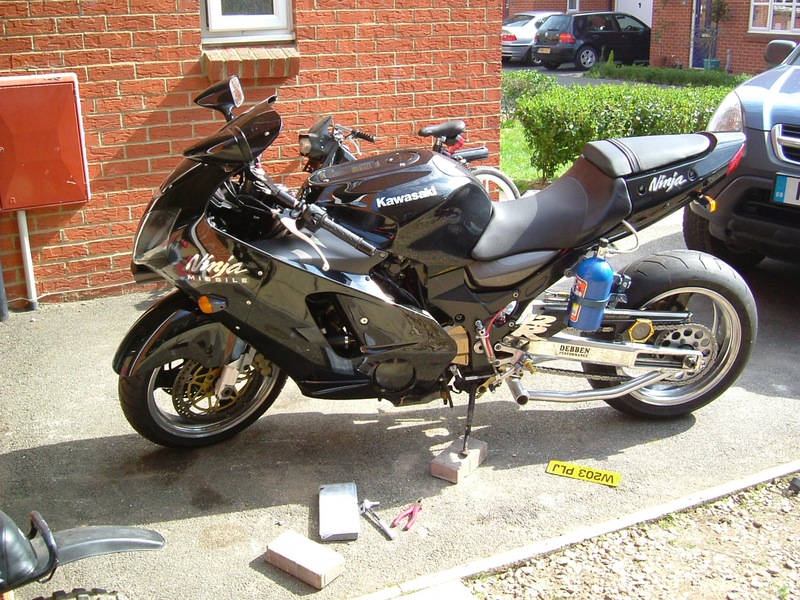 But bought a Suzuki GSX1150 – an 1135 EF and stripped it for the engine – coinciding with the emergence of Ebay, I managed to sell the frame and remaining parts and pretty much recoup the entire cost of the bike – so essentially got an engine for free, a better one too! 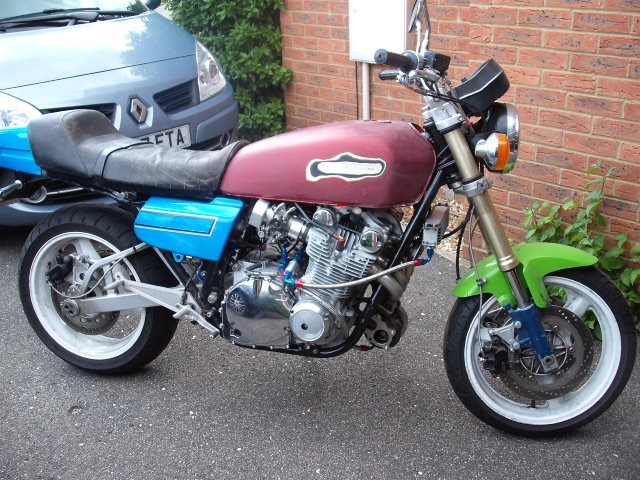 I always regret selling with bike and have always kept a look out for another – for me it would have to have the right mods – similar to the one I stupidly sold I guess! Kawasaki ZX12r – A model. Whilst playing with the Kat I wanted a top speed bike again. I’ve never been particularly brand loyal so I crossed the divide and swtich from Suzuki to Kawasaki. 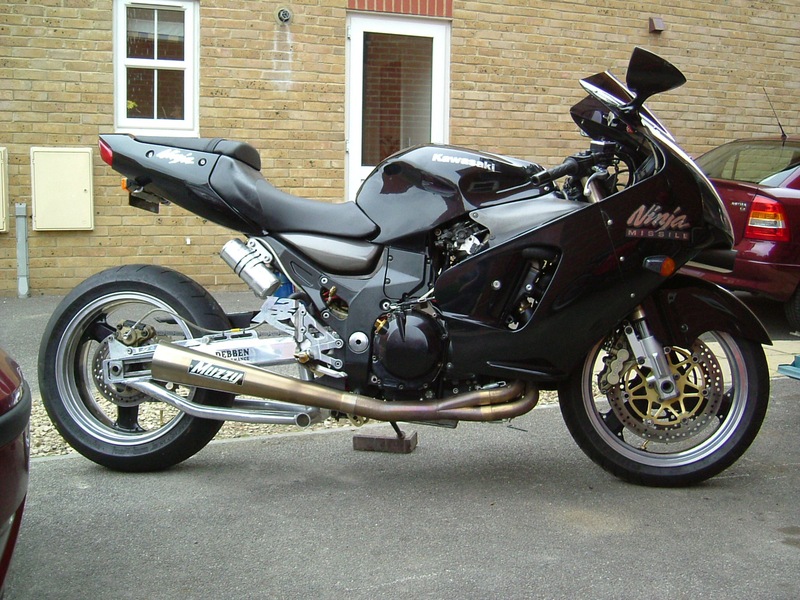 I purchases a know nitrous ZX12 widely known in the community as the Ninja Missile – built by Ray Debben down in Ringwood, the bike was standard displacement but with nitrous pistons. It had a long swing arm, cut fairings for a Muzzy sidewinder exhaust, full lock-up clutch, air shifter running off the horn and various electrical gubbins to give it a 50+ shot of nitrous. I’ll be honest it never really worked all that well and like most nitrous bikes on flyers actually went slower with the gas – but boy did it look mean! Kawaski ZX12 – B model. 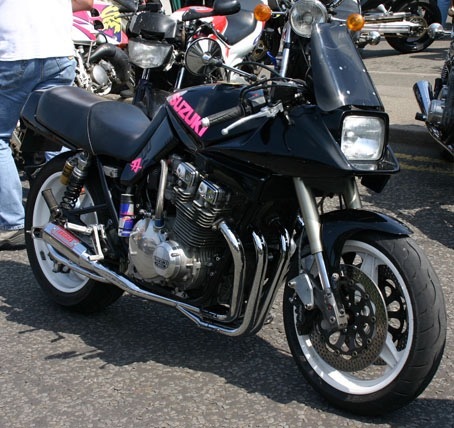 Next, I bought a big-bore ZX12 B model from a friend – a 1287cc I think, again long arm, cosmetically tweaked and a whole lot more subtle than the Ninja Missle. I commuted on this bike, did a few ‘flyers’ and even rode it to Milan and back. Straight after that journey I rode it again at Woodbridge and it suffered from oil starvation at about 170mph and the engine literally exploded – I have a picture somewhere of me looking through the engine – it threw all the pistons and made the conrods look like charcoal! Luckily I brought the flaming bike to a standstill upright and the marshals put it out pretty quickly – that was the end of the racing for the weekend though. 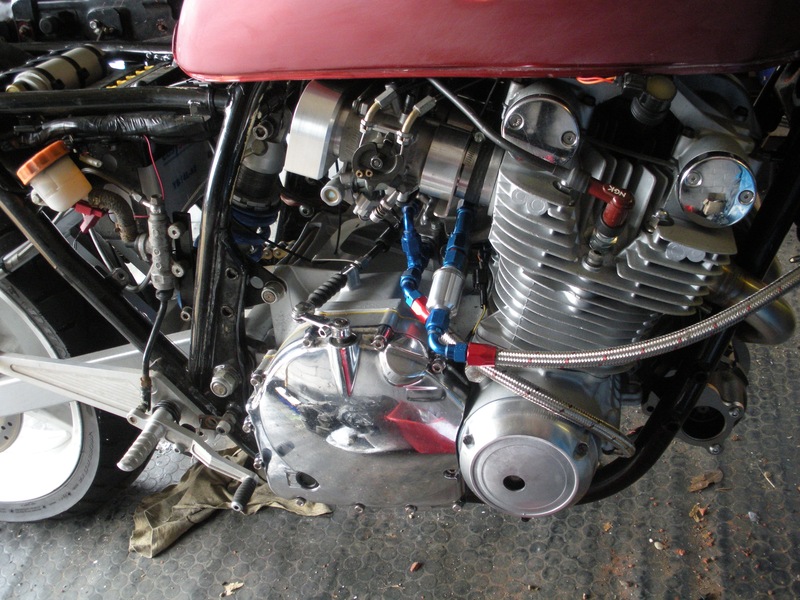 The engine was toast – so I bought a replacement and then went wild on the rebuild – John Warrington and I spec’d with a 1394 stroker using an APE kit and we created a beast. 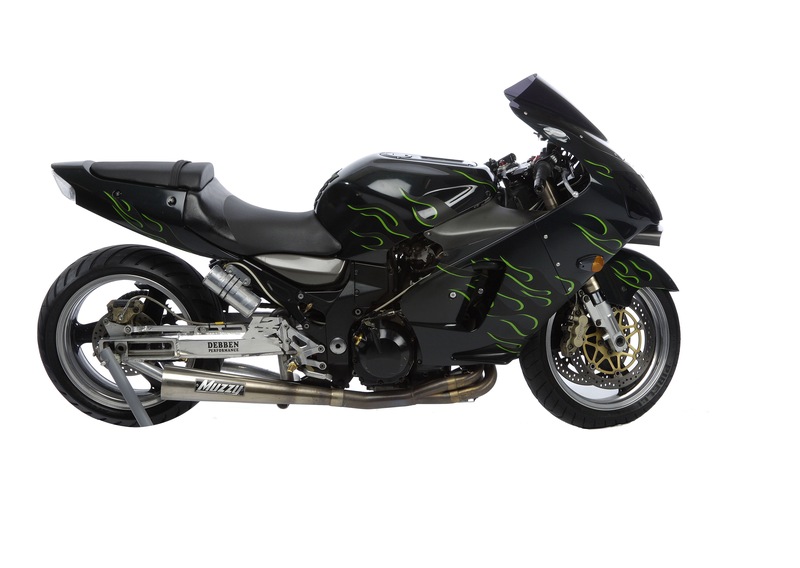 Over 200hp and 200mph in everyday road tune – it was featured in a magazine, Fastbikes I think on their 200th edition (see the theme ? 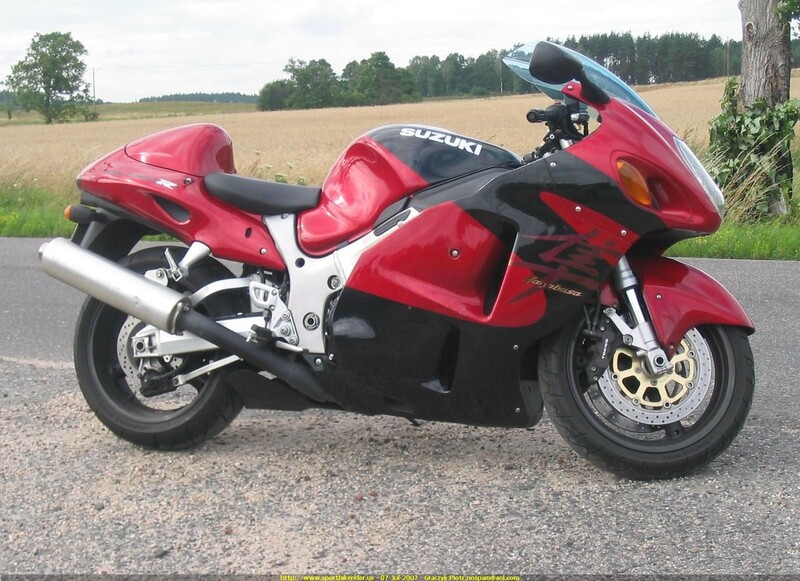 J) and was the bike on which I broke that 200mph barrier. 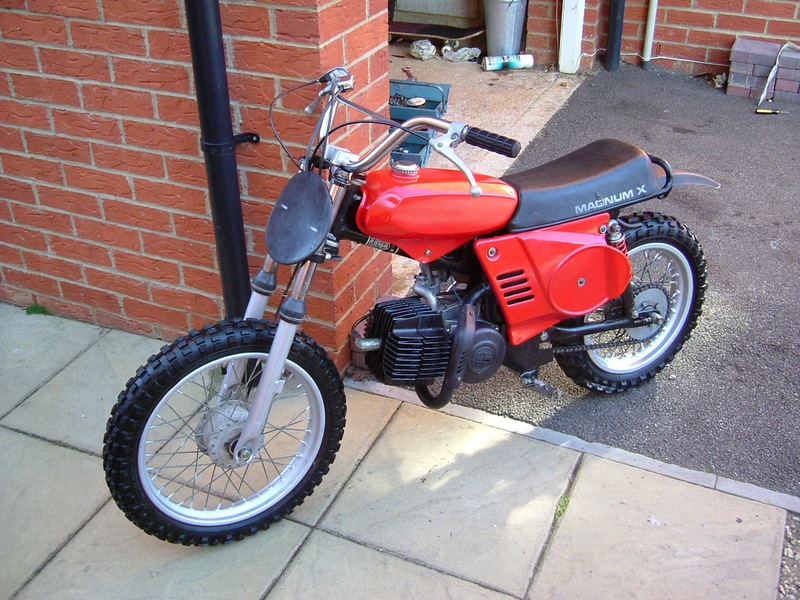 A Puch Magnum – ‘borrowed’ from a friend who’d had it when he was a kid, then neglected it for 20+ years, I stripped this and rebuilt it for my son. It has now gone full circle and again some 15 years later I have given it back to that friend and he has had it recommissioned for his sons. 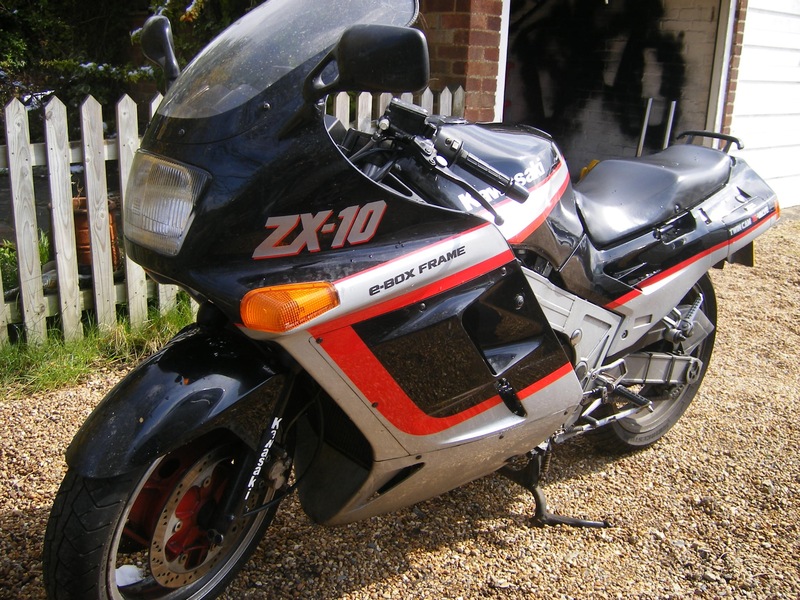 A couple of ZX10 – I love the shape, I bought 2, the one pictured and another US spec one with slightly more HP. 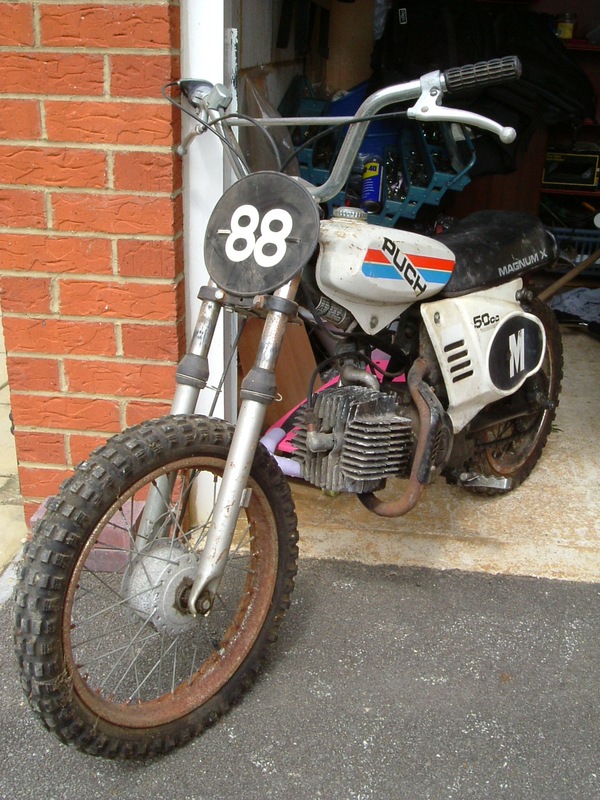 A DR750, The thumper – I didn’t keep this long, but did manage to fall off it whilst as a standstill in a layby once! 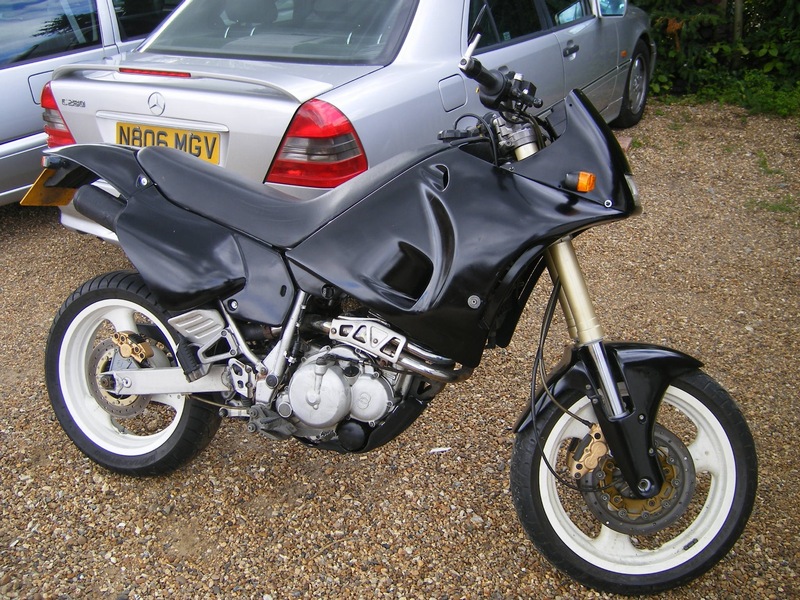 Gilera Nordwest – the original supermoto? I messed around with this for a while, great fun, but no power. Puches – is that a word. I had a few Puch. Mostly useless, one awesome. One year whilst preparing for a weekend of Top Speed Flyers a few of the 200mph Club guys got together and we threw down the Step Thru Challenge – to be held during a lunch break the rules were simple – a 1/8 sprint – start with a 50cc step thru moped, anything goes, but not turbo or nitrous. All in the name of fun. I chose a Puch Maxi – a piston kit took it to 80cc, a reed carb, alloys, cut frame, trick forks, exhaust etc etc… It won, but died at the same time. Oh yeah, I changed the engine to a ZA50 3 speed too and painted it to match the Katana. 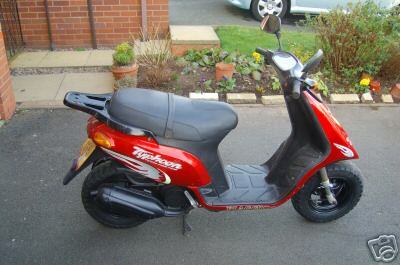 Like my ZX10s, I bought two – one in ‘poster boy’ red and yellow one and another more somber black one. I just fell for the styling – yes it ran very hot and burnt your legs, but it was great for distances and always drew a crowd. The black ones didn’t come with the K1 graphics so I made a grey set made up – something I think the factory should have done – if I’d ever found an all yellow one, I’d have bought that too. One story on the red one – I once threw it down a runway on a ¼ sprint. I lined up next to the legendary Parnell Express ZX12 for fun. Keith wasn’t riding and the rider wasn’t paying attention (that and it was a Sprint) so in the attached pic you can see I left if for dead off the line J. Of course, that was momentary! What does stand out it that after a hard launch and WOT shifting into second was quite an experience with the shaft drive. A bystander behind me swore blind that when I shifted he saw the bike lift off the ground and move a foot to the left – and it felt like that to me too! This bike had potential written all over it – but what a mess it looked. Sadly it ran out of time and was never more than a project in my hands, with the move to Dubai imminent I sold it one. 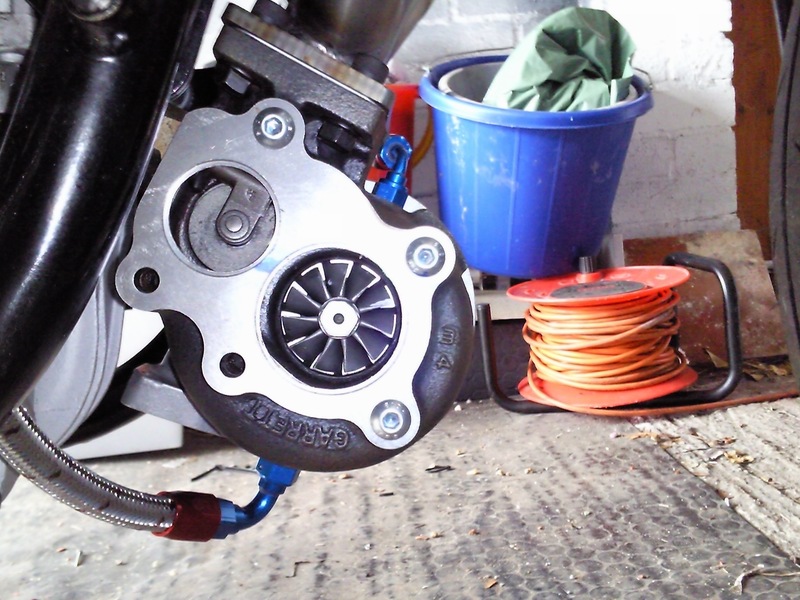 A GS1000, suspension and USD forks etc was sorted, the plan was turbo charged with EFI. 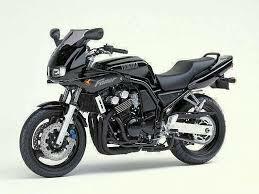 The EFI was fitted, injectors, bodies, ecu etc came from a Kawasaki ZX12. The turbo was next. Hopefully it is out there somewhere finished and terrorizing the streets! Next Next post: Zundapp Bella, a what? why?